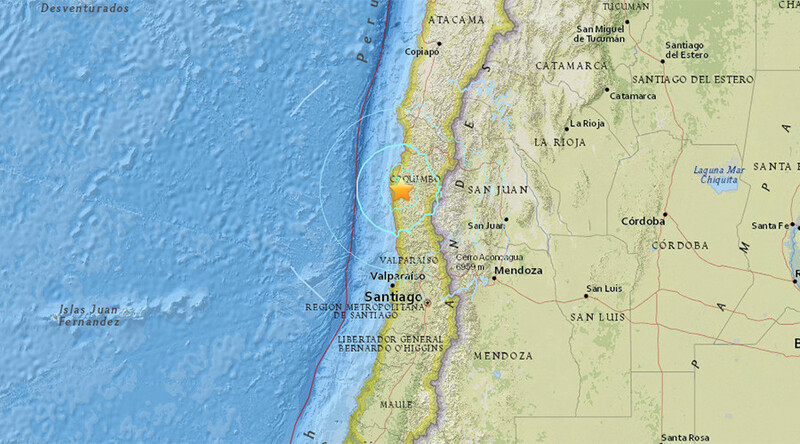 A 6.2-magnitude earthquake hit a coastal region in central Chile, US Geological Survey reports. It comes amid frequent aftershocks following a strong 8.3 quake last week. The quake’s epicenter was registered 30 kilometers southwest of the city of Ovalle in Chile’s Coquimbo Region at a depth of 38 kilometers. Another 5.1-magnitude quake followed minutes after the strong tremor, according to USGS. There was no information on damage or casualties immediately available and no tsunami warning was issued. Local media have reported at least 3 aftershocks of a lesser magnitude. According to RT Spanish, local Chilean authorities ordered a preventive evacuation of the region’s coastal areas, but the warning was quickly canceled. At least 13 people were killed and dozens injured, while about 1 million were evacuated, after an 8.3-magnitude earthquake struck Chile on September 16. The quake triggered a tsunami which flooded some of the coastal cities with waves up to 4.5 meters high. It was the strongest quake in the world this year and the biggest to shake Chile since 2010. The earthquake struck as Chileans were preparing for Independence Day celebrations, when many chose to travel to the seaside.